Congratulation on getting a boom badge. Here is a bit of information you should know before accepting or using the boom badge. Possession and use of the badge shall act as evidence of your agreement of all terms related to the boom badge. The boom badge is a novelty item, while it is made with the highest quality materials, the creators do not suggest or encourage actually firing the boom badge. Only those with extensive black powder and cannon experience should operate the boom badge in any capacity other than as a novelty item. You hereby acknowledge, do hereby release and forever discharge the creators and providers of the boom badge, and their respective heirs, personal representatives, affiliates, successors and assigns, and any and all persons , firms or corporations, liable or who might be claimed to be liable weather, or not herein named, from any and all claims, demands damages, actions, causes of action, or suits of any kind, or nature whatsoever, whether known or unknown, fixed or contingent, which I have or may hereafter have claim to have, as a result of or in any way relating to the use or possession, operation, materials, or any other actions relating to the boom badge. The ATF does not consider devices like the boom badge to be a firearm as it is a smooth bore replica cannon, however you agree you are of legal age and status to possess a boom badge, and it’s your responsibility to maintain and understand the legal standing and ramifications of possessions of the boom badge in your respective country, state, county, providence, and or city and or township. You agree you understand the operation of the badge, that it is not recommended to fire the replica, its dangers, consequences of use (intended or others wise), and that only those with extensive black powder and cannon experience should ever attempt to use the badge in any way beyond a novelty item. You agree the savings from the discounted boom badge price you were given shall act as full and complete settlement and satisfaction of the aforesaid actions, causes of action, claims and demands. If you wish to not wave liability you may pay full price which is set by the creators, you must do so in writing before taking possession of the badge and have an accompanying bill of sale showing you paid the full non-waved price of the boom badge. IF YOU ARE FLYING WITH A BOOMBADGE – please note that the TSA will NOT allow you to carry on a boom badge. They are considered a replica weapon and must be CHECKED in your check bag. No FUSES or BLACK POWDER is permitted in any way shape or form even in your checked luggage. The TSA will take your boom badge if it is detected to contain black powder. You are encouraged to mail your boom badge home if you feel it will be an issue with the TSA. !! NOT RECOMMENDED, the following is for EXPERTS in cannons and black powder only!! Before each use inspect for any damage, if the device is suspected of any failures or damage do not fire or use. Always exercise proper black powder precautions to prevent accidents. Load only when the black powder device is cool and free from any embers or any heat that could cause the powder to ignite prematurely. On a stable flat surface, loosen the thumb screws on the side of the boom badge and place the barrel in the upright position, then lightly re-tighten the thumb screws to hold the boom badge upright. Load no more than 12.3 grains of triple 7 FFF or similar grade black powder into the barrel of the boom badge. NEVER USE GUN POWDER, ONLY BLACK POWDER! Pack powder firmly with provided ram rod. This should provide a tight packing around the fuse ensuring the powder ignites. 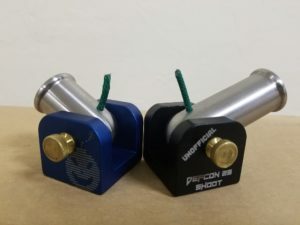 (Optional) Place in a single 5\16” steel shot (sling shot ammo works well) into the barrel and push down until it contacts the powder with a small amount of force. Wadding is not required but can be used in small amounts behind the steel shot if desired. Less powder may need to be used if wadding is used depending on the thickness of the wadding. Loosen the thumb screws and aim the boom badge in a safe direction away from people and animals and toward an appropriate backstop. When desired angle is achieved tighten thumb screws well to prevent the boom badge from changing angles when lighting and firing. Light the fuse and retreat to a safe distance minimum of 15ft and wait for the boom badge to fire. After the boom badge fires wait for it to cool before loading again or cleaning. Wait 5 minutes, return to the boom badge and place another fuse, light as before. If the boom badge still does not fire douse the boom badge with water to saturate the powder and render the boom badge safer to handle after a misfire. If the boom badge repeatedly fails to fire and a cause cannot be determined easily and without modification discontinue use of the boom badge. Exercise the same precautions as any other black powder device! To clean the boom badge, use rubbing alcohol and que tips or stainless steel safe bore cleaner. A small pick or pipe cleaner can be used for the fuse hole. Always clean the boom badge after use to prevent any buildup of excess materials. After cleaning oil is not required but a black powder \ firearm safe lubricant can be used to protect from corrosion, though it should be used sparingly. Never fire the boom badge at anyone or anything you are not willing to harm or destroy. Never use gunpowder or high explosive materials as the boom badges are not designed to have high heat elements burn inside them. Never use tightly fitting shot or wadding as it can cause the boom badge to fail catastrophically, resulting in injury. Never shoot from a hand or attached to the lanyard, always place on a safe level surface before loading and firing. Never modify the boom badge.